Lt. Sharon Valerii wakes up soaking wet in the tool room with an explosive charge in her duffel bag. 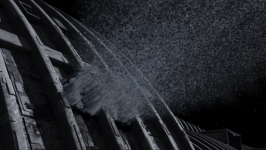 Shortly afterward, a mysterious explosion destroys all the port-side water tanks on Galactica, creating a crisis for the entire fleet. Sharon can't remember a thing, but all the evidence points to her as a saboteur. She confesses her concern to Chief Tyrol, but he can't believe she's responsible. As water riots erupt, Commander Adama and President Roslin struggle to contain the crisis, putting all the ships on limited rations and assigning Baltar the job of rooting out any Cylons who may have infiltrated the crew. - It's clear that battlestars are designed to be self-sufficient for possibly years-long journeys as evidenced by its immense water storage systems and water recycling systems. So does the Galactica have means of producing its own food? Possibly some sort of hydroponics bay? Does the fleet have any sort of farm ship, or a ship that has been converted into a farm ship? Are there any animals in the fleet which are being bred for meat? These are all questions we've not received sufficient answers to. This is not necessarily a technical problem, but some answers would have been nice, given Baltar's outlining of how much food the fleet will need. 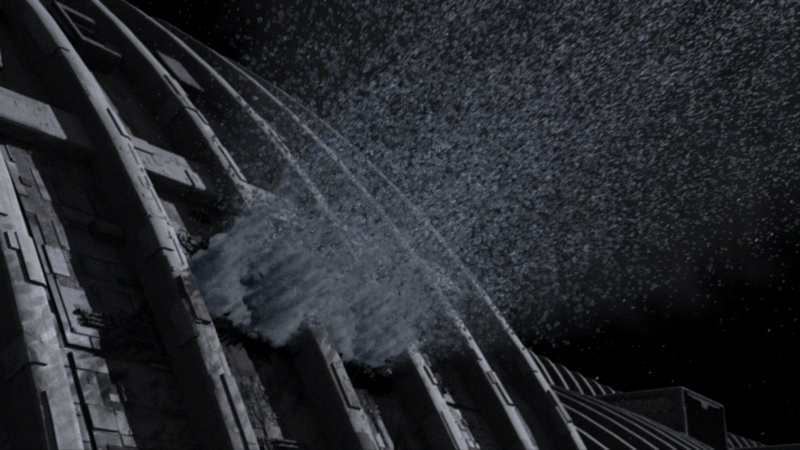 - According to Adama, Galactica's water recycling system is near 100% effective. For all intents and purposes there is not one drop of water that is wasted. The Galactica can go several years before actually needing to replenish water supplies. - The Virgon Express was not made for long term voyages and depends on Galactica's water supplies. - The current civilian population according to Baltar is 45265, but he claims that this figure is based on "information available to him at the time" which could explain why it is inaccurate. - The fleet's population will require at minimum 82 tons of grain, 85 tons of meat, 119 tons of fruit, 304 tones of vegetables, and 2.5 million JPs (whatever that is) of water per week. - Some time prior to this episode, President Adar sent the marines into Aerilon for some reason and as a result 15 people died tragically. - Roslin's whiteboard reads at the end of this episode 47958. - Tigh rationing what's left of his alcohol. - Roslin: "The military, they do love their protocol." Billy: "Well I'm sure if they knew you didn't like it they'd be willing to--" Roslin: "No, let Adama sound the trumpets. I think it makes him feel more comfortable and if he feels more comfortable he'll be a little easier to deal with." Billy: "That's smart." Roslin: "No, it's not smart. It's politics." - Roslin: "I think I'm going to get tired of this outfit, seeing as how I only have three, for the rest of my life." Billy: "It looks fine." Roslin: "Fine?" Billy: "It looks great." Roslin: "You don't know anything about women, do you?" - Billy's "I don't know anything about women" faux pas with Dee. - Tigh: "Most planets are just hunks of rock or balls of gas. The galaxy is a pretty barren and desolate place when you get right down to it." - Baltar's technobabbly explanation for why he hasn't implemented wide scale Cylon detection. - Baltar joining the card game to lose Gaeta. - Baltar beating Starbuck at cards. - Tigh regarding Galactica's inability to find more star systems with possible water sources: "I just checked with Astrometrics. They're coming up with big goose eggs." - Roslin recruiting Apollo for advice about the military. Water is an episode that is good, but not great, as it fails to deliver on a few levels. One of the first and most important questions in the audience's mind about how the fleet could possibly survive these circumstances and this extended voyage to who knows where is how will they maintain adequate food and water? Unfortunately, the plot of this episode solves the water problem at the expense of the food problem. This episode is, as the title implied, all about water. But Dr. Baltar outlines some pretty hefty food requirements for the fleet in addition to his outline of the water requirements. The episode does nothing to address the food problem, even though Roslin hints that both food and water are a problem. It could be inferred that without water you can't grow food and that by solving the water problem you solve the food problem, or any number of other things could be inferred, but the fact of the matter is we receive no such information about the existence of farm ships, or anything else of relevance regarding food, and I feel that this episode suffers from this. Moving on, let's talk about Boomer. This episode is Boomer's episode, as it kind of centers around what's going on with the Galactica version of her. After all, we know she's a Cylon, so what's her evil plan? Well, this episode makes it pretty clear that she's a sleeper agent. She probably knows she's a Cylon deep down, but just doesn't want to face it. In a kind of sad ironic parallel, Tyrol's so in love with her that he denies obvious signs that she's a Cylon as well. Thus the circle of self destruction is complete. Speaking of self destruction, I thought it was cute that Tigh was rationing his alcohol. This is a very realistic thing for him to be doing, and I'm glad the writers decided to include that scene. The Boomer on Caprica gets less to do, but the Caprica plot advances a bit. It appears as though the Cylons planted a Raptor then "found" it to make it look like Sharon came back for Helo, but her Raptor was discovered by the Cylons. We can infer from this that the Cylons must want to keep Helo and Sharon on the planet together. It's also possible the Cylons manufactured the military signal that Helo and Sharon hear as further encouragement to stay on Caprica, but as of yet that can't be known for sure. Speaking of relationships, I found it amusing that Adama gives Roslin a book, which seems to be to be something of a peace offering. A kind of "let's not be tense around one another anymore; let's be friends" kind of move. It's also nice that Roslin and Apollo both feel guilt over their roles in the destruction of the Olympic Carrier. Sadly though, these guilt scenes suffer from 33's single weakness - the fact that there was apparently nobody in fact on board that ship. So one wonders what exactly they're feeling guilty about. The final plot point worthy of discussion is why Boomer acts so strangely. You're either a sleeper agent or you're not, right? Well, Boomer may be a sleeper agent, but she's not a very good one. The only conclusion I can come to is that she's a potentially partially defective model. Evidence lending to this theory includes her aborted intent to go blow herself up and sabotage the water mission; she couldn't bring herself to do it. Or was she simply suicidal because she knew she was a Cylon and she wanted to kill herself before she did something terrible? Boomer's apparent tortured mind is what makes this episode so interesting, but at the same time it seems a little over done. There are far too many scenes emphasizing this most of which go on for far too long. At some point the danger starts to feel manufactured. I feel as though these issues could have been examined more eloquently and while this episode is quite good, pales compared to the material in the miniseries and 33.